“What is a biblical canon list,” you ask? It is an ancient list of biblical books usually drafted by a church father or synod to specify those books churches recognized as authoritative for doctrine. For example, St. Gregory of Nazianzus drafted a canon list of books (381–90 AD) that promoted piety on the one hand and defended from heterodoxy on the other. At the end of his list, he made clear, at least in his mind, that this list was final and exclusive, “You have all. If there is any book outside of these, they are not among the genuine ones.” Gregory was aware of “many, strange books” and “interpolated evils” that had come into being, and his list specified the genuine books so that the reader might also be able to recognize the spurious ones. Sometimes in the context of a canon list, a father would also draft another list that included other books of a secondary status or position; that is, books not recognized as canonical but books to be read to new converts or useful and beneficial books (e.g. Wisdom of Solomon or the Shepherd of Hermas). Why are these canon lists important? They provide the clearest, most specific information regarding the Bible’s contents in antiquity and therefore will be of interest to anyone who has wondered how they got their Bible. Until now, access to these ancient biblical canon lists was a challenge for the student and scholar alike. 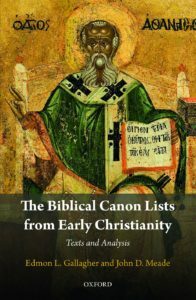 Ed Gallagher and John Meade wrote the The Biblical Canon Lists from Early Christianity: Texts and Analysis (Oxford University Press, 2017) to make these sources available in one volume. After a substantial opening chapter on the evidence and views of the early period, they provide a chapter on Jewish lists (Josephus; Babylonian Talmud); three chapters on Greek, Latin, and Syriac Christian lists respectively; a substantial chapter on the contents of early Christian manuscripts; and finally, an Appendix which treats the disputed and more common apocryphal books. The famous canon lists of Eusebius, Athanasius, Jerome, and Augustine along with many others are now included in one volume. The book presents each list in two columns, the first containing the list in its original language, while the second contains an English translation with commentary in footnotes. Dr. John Meade joined the Phoenix Seminary faculty in 2012. 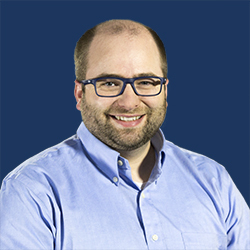 He teaches courses in Hebrew Language and Old Testament Literature along with elective courses on the Septuagint, the Apocrypha, the Canon of Scripture, and Biblical Theology. He and his wife and four kids attend Trinity Bible Church where he serves as community group leader and Sunday School teacher.